← SAP “Run Simple” is great for the future, but what about the complexity of the past? This is the latest in an occasional series of data models which will give some insight into those common business areas in SAP and ORACLE applications for which data models are often required for Information Management projects. 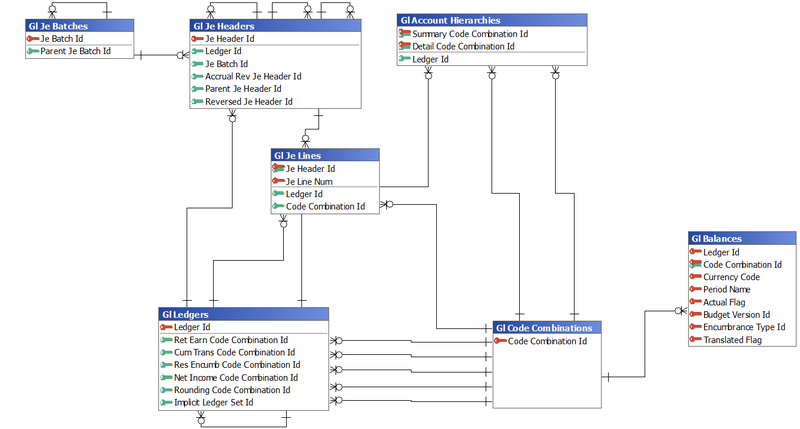 It’s a group of tables in the form of a data model from an Oracle Enterprise Business Suite system showing a set of General Ledger tables and relationships. The model was created following some analysis in Safyr and then exported. I’m posting it as an image built using Safyr’s own redesigned ERDiagrammer tool which comes with the latest and greatest version of Safyr – 6.3. I can easily make the same set of tables available in ERwin, ER/Studio or PowerDesigner formats – please feel free to ask if you would like to see it in one of those formats. There is no obligation and I’d be happy to provide. The usual problem when creating any model (apart from making it look nicely laid out!) is to decide where to stop. How many tables should I include? There are literally hundreds of tables in EBS that are ‘General Ledger’ tables and so the trick is deciding which are relevant to the job in hand. This is a particular view of some of the tables which are part of the eBusiness Suite General Ledger data model. I could have made it larger or used different tables, perhaps from a different start point or search term to meet a different business need. The result is a static model reflecting what I was searching for at the time. If I needed to find an alternative group of tables I would have been able to achieve that quickly and easily using Safyr and it would have picked up any customisations to the system. That’s what Safyr is all about – enabling you to scope the set of tables that are relevent to your project – and of course you and your team are the best people to decide that. Safyr gives you the power to work it out yourself without needing to involve specialists or external consultants. This entry was posted in Data, Data Management, Data MOdel, Data Model, Enterprise application, Enterprise Information Management, Enterprise Metadata Management, Metadata, Metadata discovery, Oracle, Safyr, Uncategorized and tagged Data Discovery, data modeler, data models, General Ledger, metadata, Oracle eBusiness Suite. Bookmark the permalink.